The troupe has been chartered by Alhambra High School. The charter affiliates it with the International Thespian Society (ITS), a division of the Educational Theatre Association. The troupe is the honors component of the school’s theatre program. 1.1 Any and all student’s grades 9, 10, 11, and 12 of Alhambra High School are eligible for membership into the A.H.S. Thespian Society. 1.2 Membership is achieved by consistently showing up to most of the Thespian meetings. 1.3 To be a member of the A.H.S. Thespian Society is free however, to be a member of the International Thespian Society the member must a pay a fee of twenty-two dollars. 1.4 To be inducted into the International Thespian Society the inductee must meet all the criteria as defined in the troupe handbook. 1.5 Any member who causes deliberate dissension or disruption of any production or business meeting may be denied participation in troupe activities by the troupe officers and troupe director. 1.6 Any member requesting reinstatement of participation rights may have them restored with the consent of the troupe director and the troupe officers. 1.7 An International Thespian member will be considered inactive and have all points taken away if he or she does not work on a production for one year. 2.1 Its purpose shall be the advancement of standards of excellence in theatre. More specifically, the troupe will encourage students to attain a better mastery of the theatre arts and will reward those who achieve it with induction into the troupe. Thespians achieving honor ranks shall receive recognition of their exemplary accomplishment. 3.1 Meetings will take place every week on Thursdays in the Little Theatre/M2-M8 ten minutes into the lunch period. 4.1 The Thespian troupe shall have the following officers: President, Vice President, Secretary, Treasurer, Historian and Comedy Sportz manager. Troupe officer duties are defined below. B. The Vice-President presides in the absence of the President and is responsible for the induction of new members. The Vice-President also maintains communication with the community through posters, email blasts, and other means of communication. C. The Secretary keeps the records of meetings and attends to troupe correspondence. The Secretary also keeps track of all points members earn throughout the year. D. The Treasurer keep’s the troupe’s books and pays bills, and may act as business manager of Thespian productions. E. The Historian builds collages of drama events, productions and anything else the club may do. F. The Comedy Sportz manager works to plan, execute and facilitate all Comedy Sportz performances. 4.2 Requirements for all elected officers are as follows: each student must be an active member of the troupe for at least one school year, and at the time of election must be enrolled in grades 9, 10 or 11. All officers must attend a leadership conference before their term begins. 5.1 Nominations for officers are to be made from the floor during a special meeting. Students may self-nominate. Officers will be elected by a majority vote. 5.2 Elections will be conducted at the last meeting before the Awards Banquet each year. 5.3 Voting will be done by a secret written ballot at an official troupe meeting. 5.4 Officers shall be installed at the Awards Banquet each year. 5.6 An officer will be taken off of probation with the troupe director and other officer’s permission. 6.1 To conduct a meeting three officers including either the President or Vice-President must be present. 7.1 Prior to funds raised, activities must go through the approval process designed and monitored by ASB. 7.2 Money raised will be deposited into the Student Bank. Money deposited, withdrawn, or expensed must be stated in club minutes. 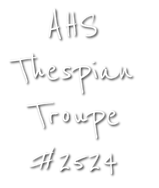 7.3 The only members who have rights to the Thespian account and budget is the Troupe Director, President, Vice-President and Treasurer. 7.4 If the A.H.S. Thespian Society was terminated, the troupe’s funds will go directly into the A.H.S. Comedy Sportz club account. 8.1 This constitution and its amendments shall be subject to change according to any or all requirements of the International Thespian Society. Clubs upon approval must abide by all school, district, and state laws regarding extracurricular activities. Violation of any of the laws will result in consequences stated by the ASB and/or Activities Director. The Assistant Principal, Business of Activities and/or Principal will make final decision of consequences.